The American Dream is contemplated by both Booker T. Washington and W.E.B. Du Bois. The American Dream is contemplated by both Booker T. Washington and W.E.B. Du Bois. As they dare to dream of a harmoniously integrated cultural identity in this great country, Washington and Du Bois have an important message for Americans, both black and white. This research paper will examine the very different ways in which the authors present the problems and issues of a race newly emancipated, as well as the solutions suggested by each work. Though the main purpose of a term paper is not to retell the stories in full, summaries will be offered as a foundation for the main thrust of this effort. One might assume that so much progress has been made in race relations that the works would seem quaint and dated. Sadly, such is not the case. It has been noted that after the Civil War, the industrial machine that cranked out thousands of rifles and cannons and war material of every kind continued to grow and expand in the reunified nation, turning America into the greatest industrial power on earth. The men who formed the new industrial revolution, who combined the various industries into massive trusts, men like Andrew Carnegie and John D. Rockefeller, cared for little else than profits. This era brought about an era of progressivism. Perhaps the most significant group to be empowered by the spirit of Progressivism was African-Americans. Two great leaders—Booker T. Washington and W.E.B. 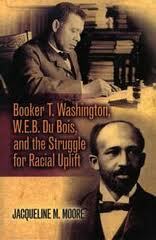 Du Bois—emerged with different agendas for advancing African-Americans towards equal rights. Paper Masters writes custom research papers on Booker T. Washington and W.E.B. Du Bois and on the American Dream.